Melt Parkay in large skillet over medium heat 3 to 5 minutes or until Parkay just starts to turn golden brown, stirring occasionally. Remove from heat. Add honey, vinegar, mustard and pepper flakes; stir with wire whisk until well blended. Return skillet to heat. Add shrimp; stir to coat evenly. Cook 4 minutes or just until shrimp turn pink, stirring occasionally. Spoon shrimp onto serving plate; top with mustard sauce. 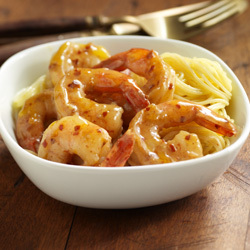 Serve shrimp with angel hair pasta, if desired.